One thing that can be said with certainty about the Great Lakes ecosystem, is that it is in a constant state of change. The primary question for NOAA’s Great Lakes Environmental Research Laboratory (GLERL) is, how can we most effectively research and manage the lakes given their changing biological, physical, and chemical conditions? The answer, in part, is to build our capabilities in taking an integrated, science-based adaptive management approach in the conduct of research and ecosystem management. Adaptive management—a concept that has been evolving in the Great Lakes region since enactment of the 1972 Great Lakes Water Quality Agreement (GLWQA)—integrates well-defined feedback loops in the process of doing science-based research and management, thus providing a way to respond to ecosystem changes. The ultimate goal of using an adaptive approach is to continually evolve the research and management of the Great Lakes ecosystem while accounting for uncertainty in the conduct of science. Though it could be said that adaptive management is a common sense, verify as you go approach, in order to render a significant impact in the mitigation of problems/stressors threatening the Great Lakes, an integrated, science-based, adaptive management approach must be purposefully executed and institutionalized on a long-term basis with reliable funding. So what do we really mean by taking a science-based, adaptive management approach? And how are we doing it? The International Joint Commission (IJC), established by the United States and Canada to prevent and resolve disputes about the use and quality of the Great Lakes boundary waters, has played an important role in shaping adaptive management as an approach to protect and restore the Great Lakes. Through the lens of the IJC, “Adaptive management is a planning process that provides a structured, iterative approach for improving actions through long-term monitoring, modelling, and assessment. Adaptive management allows decisions to be reviewed, adjusted, and revised as new information and knowledge becomes available, and/or as conditions change.” (Upper Great Lakes Lakes Study, IJC 2012). There is growing awareness that we need to be adaptive in our approach given that managed resources will always change as a result of human intervention, that surprises are inevitable, and that new uncertainties will emerge. Adaptive management should not be considered a ‘trial and error’ process but rather one that is built on “learning while doing.” (Williams et al., 2007). At GLERL, we are striving to integrate adaptive management in a deliberate way in the design, conduct, and overall management of our research projects. On the most basic level, adaptive management provides a framework upon which research is structured, using measurable goals and objectives to assess and evaluate outcomes with each cycle of research. The role that adaptive management is expected to play in GLERL research is delineated in GLERL’s 2016 Strategic Plan (pp. 17-23). This approach is exemplified by research on the causes and impacts of harmful algal blooms (HABs) and hypoxia (a condition when oxygen levels within the water become extremely low) in western Lake Erie as conducted by GLERL, in conjunction with Cooperative Institute for Great Lakes Research (CIGLR, formerly CILER). Further information on GLERL’s HABs and hypoxia research is available on GLERL’s webpage, Great Lakes HABs and Hypoxia. Reducing nutrient loading of phosphorus and nitrogen. Understanding impacts of HABs on food web structure and potential impacts on fisheries, increased water treatment costs, lost opportunity costs for recreation, and shoreline property values. Understanding toxicity level impacts on human health. The next step in an adaptive management approach is formulating research goals, objectives and questions—based on identified priorities—that are measurable and can result, in part, from stakeholder engagement. A measurable goal established for HABs research and management is a 40 percent target reduction in spring loads of phosphorus to minimize the size and impact HABs in western Lake Erie. Fundamental to an adaptive management approach is the measurement of progress toward reaching the research and management goals and making adjustments accordingly. Another important driver in the adaptive management cycle is feedback based on the assessment and evaluation of research and management results and other outcomes. The transfer of results/outcomes to the scientists, managers, as well as stakeholders, provides an opportunity for the adaptive approach to refine and improve the next round of HABs research. For example, recent HABs research has pointed to nitrogen as an important driver of bloom toxicity; these findings have played an important role in shaping GLERL’s future research agenda. In our ongoing commitment to serve the Great Lakes community through our research, GLERL’s efforts can only be strengthened through adaptive management by ensuring that stakeholders—such as water intake managers, fisheries managers, land use managers, public health agencies, environmental groups, and the general public—are given the products and tools needed to mitigate the sources and impacts related to HABs and hypoxia (see story on hypoxia stakeholder workshop). This approach holds great promise in improving the ecological as well as economic health of the Great Lakes region. This diagram was developed to depict the adaptive, integrated approach that characterizes GLERL’s scientific research. The iterative, longterm, systematic process of using an adaptive integrated research framework provides an opportunity to refine research and ecosystem management approaches. The cycle of an adaptive integrated research framework used in conjunction with the best available science, provides iterative feedback loops incorporated as part of GLERL’s research methodology. The coupled feedback loops depicted above show the interrelationship between research management and ecosystem management, both driven by assessment and evaluation as well as stakeholder input. Categories: Communication, Research | Permalink. Lake Erie’s “dead zone” not only impacts the lake’s ecosystem, but also poses challenges for managers of drinking water treatment facilities. The Lake Erie dead zone is a region of the central basin where oxygen levels within the water become extremely low, creating a condition known as hypoxia. Great Lakes researchers are sharing their scientific expertise to help managers be fully prepared for threats to drinking water resulting from hypoxic conditions. Scientists from NOAA GLERL, Cooperative Institute for Great Lakes Research (CIGLR) and the Great Lakes Observing System (GLOS) met on May 23 in Cleveland, Ohio with water plant managers from the southern shore of Lake Erie for a stakeholder engagement workshop to discuss the hypoxia issue. An important focus of the workshop was the development of a new hypoxia forecast model that will act as an early warning system when hypoxic water has the potential to enter intakes of water treatment facilities. 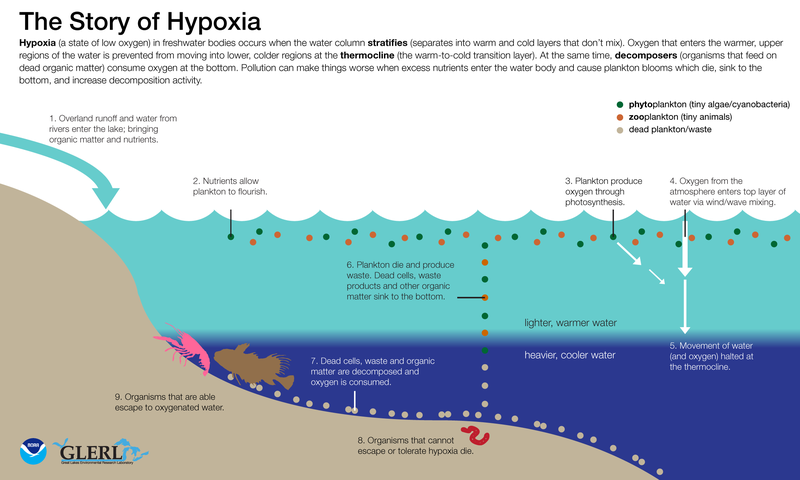 The depletion of oxygen in hypoxic water occurs when the water column stratifies (separates into warm and cold layers that don’t mix). Oxygen in the lower, cold layer becomes depleted from the lack of mixing with the upper (warm) layer that is exposed to air, as well as from the decomposition of organic matter (dead plants and animals) in the lower layer. The process of hypoxia is illustrated by GLERL’s infographic, The Story of Hypoxia. Stakeholders who attended the workshop explained that water treatment operators must be prepared to respond quickly during a hypoxic event to ensure that drinking water quality standards are met. Hypoxic water often is associated with low pH and elevated manganese and iron. Manganese can cause discoloration of treated water, while low pH may require adjustment to avoid corrosion of water distribution pipes, which can introduce lead and copper into the water. At the workshop, researchers shared information on lake processes that contribute to hypoxia and on development of the Lake Erie Operational Forecasting System that provides nowcasts and forecasting guidance of water levels, currents, and water temperature out to 120 hours, and is updated 4 times a day. Information was also shared on preliminary hypoxia modeling results that simulated an upwelling event (wind-driven motion in the Great Lakes, pushing cooler water towards the lake surface, replacing the warmer surface water) that brought hypoxic water to several water plant intakes in September, 2016. Water plant managers reported that advance notice of a potential upwelling event that could bring hypoxic water to their intakes would be useful to alert staff and potentially increase the frequency of testing for manganese. Stakeholder Scott Moegling, Water Quality Manager at City of Cleveland Division of Water, also recognizes the value of engagement between the stakeholders and the Great Lakes researchers. Moegling points out that “the drinking water plant managers not only benefit from sharing of operational information and research, but also by establishing lines of communication between water utilities and researchers that help identify common areas of interest. The end result—researchers providing products that can be immediately used by water utilities—is of obvious interest to the water treatment industry on Lake Erie.” Moegling also views the GLERL/CIGLR research on the hypoxia forecast model as holding great potential in predicting hypoxic conditions in Lake Erie and believes that once the model is developed and calibrated, there may be a number of other possibilities for highly useful applications. In addition to sharing the latest research on hypoxia, the stakeholder engagement workshop provided a forum for water plant managers to share information with each other on how to recognize hypoxic events and efficiently adjust water treatment processes. Researchers at CIGLR and NOAA GLERL are committed to conduct research that serves society, and will continue to work with this stakeholder group over the course of the five-year project to develop a hypoxia forecast model that meets their needs. Categories: Communication | Tags: drinking water, great lakes, hypoxia, Modeling, operations, Planning, Research, science, water quality | Permalink. Welcome to the Great Lakes Environmental Research Lab’s blog where you’ll find the latest news and information about our research! We’re part of the National Oceanic and Atmospheric Administration. Learn more on our website: www.glerl.noaa.gov.